Home /Multimix Radio/OECS SONGWRITERS AND PRODUCERS STEP FURTHER TOWARDS PENETRATING THE INTERNATIONAL SCENE. 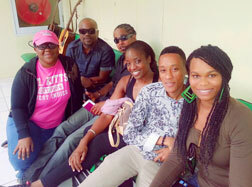 OECS SONGWRITERS AND PRODUCERS STEP FURTHER TOWARDS PENETRATING THE INTERNATIONAL SCENE. Roseau, Dominica: May 14, 2014 —- Leading songwriters and producers from across the OECS have made a further step towards penetrating the international market. Described as a major success story coming out of the just ended historic “Work Camp” which ran from May 10th to 12th in Dominica, the participants produced musical compositions which are expected to be released within the next few months. The OECS Export Development Unit says participants produced more than 14 songs highlighting the creative expressions and the rich reservoir of talent to be found across the OECS. Songs ranged from ballads to up-tempo Caribbean rhythms reflecting rich diversity and immense skills of the songwriters and producers who participated in the Work Camp. The material produced at the work camp is being reviewed for final production of a compilation of songs for regional and worldwide distribution. All songwriters and producers will be credited for their contributions and will be entitled to a split in royalties and copyright payments once the material is released. The OECS Export Development Unit (EDU) organized the three day Regional Songwriters and Producers Work Camp which was coordinated by Island Network of Saint Vincent & the Grenadines. The songwriters and music producers represented the British Virgin Islands, Antigua and Barbuda, St. Kitts and Nevis, Saint Lucia, Saint Vincent & the Grenadines, Grenada and host country Dominica. Music Producers Mark Cyrus of Saint Vincent and the Grenadines, Cornel Phillip and Krishna “Dada” Lawrence of Dominica as well as Neil Bernard of Trinidad & Tobago were facilitators at the work shop, while the Camp mentor was Canadian-born (with Jamaican roots) internationally acclaimed song writer/producer, Rupert Gayle. The Regional Songwriters and Producers Work Camp was supported by the 10th European Development Fund (EDF) for Regional Integration and Trade for the OECS and is among several activities targeted to build the competitiveness of the creative industries sector in the OECS.